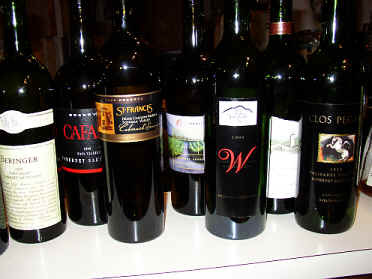 This group of wines features some rather costly bottles of wine. Ellen, who usually tastes through the wines ahead of the group, has a lukewarm reaction to the set. 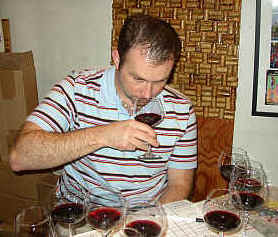 I, too, was less-than-thrilled, especially since I know how much I paid to buy these bottles of wine for the tasting! 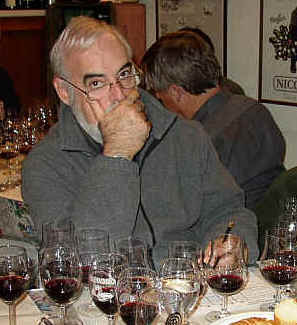 I sensed, as well, few people were especially enthralled with the wines. At this point in time, I would say my top ranked wines are probably "worth" about $50. That most of them are priced significantly higher reflects great optimism on the part of the producers. Perhaps there is a large volume of customers who value the wines at these elevated prices. But certainly the premium price does not, as we've seen once again, guarantee a wine of superlative quality. 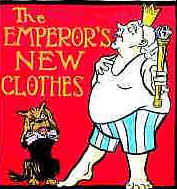 The emperor, it seems, often goes naked when it comes to many California Cabernets. This was described by one taster as redolent of "strawberry jam, very sweet, medium-bodied Cabernet that's drinkable now and over the next 3 to 5 years." A second critic found it to be a "pleasant wine." Someone else found "a core of bitter blackberry extract, currants, plums and anise with biting tannins on the finish." A fourth person claimed it's "too acidic and has a short finish." Another taster said "it's out of whack in terms of its balance. 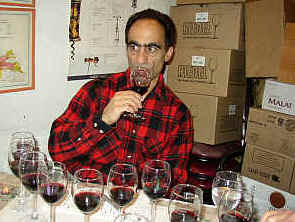 The tannins are very aggressive and the wine has a short finish." 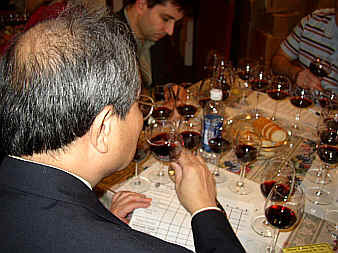 Gerald found "nice berry notes on the nose with a hint of oak and a light note of soy sauce. Ripe. It's a pleasant enough wine on the palate, with some woodsy flavors and a bit of tannin, but not an especially profound wine. I would never guess this to be such a costly wine. One star on my three star scale...no stars is an ordinary wine." 7th Place: BERINGER 1999 Napa "Private Reserve" CABERNET SAUVIGNON"
One taster encountered a note reminding them of "H2S, but this seemed to blow off. Then I found Brettanomyces." Another taster encountered "herbal notes with hints of green olives and dill pickles...it's really more like some of the under-ripe 1998s." Someone else found it "under-ripe, but the wine did blossom a bit in the glass, becoming more complex." Another person had a much different view, finding the wine to be "dark, muscular, plush and showing smoky currants, tobacco and some coffee grounds. There's a green, lightly herbal note, but it's not totally unpleasant." Someone else felt it was "mediocre," while another taster detected lots of "burnt coffee notes." Gerald found this to show "dark fruits and some toasted and roasted elements with a bit of an herbal quality here. It seems rather supple in the center but rough around the edges. Over all, a nice wine and worthy of one star. I am not sure it merits its elevated price." "This shows rich, earthy, concentrated notes with hints of tar, lead, nuances of sage and a funky ink-like note on the finish." said one wordsmith. Another taster found it "shallow, supple, pleasant but with a sting of alcohol on the palate." "I agree," said someone else, finding this also to be "Zinfandel-like in some respects." One panel member found "red licorice, coffee and spices, with a hint of forest-floor notes and some exotic spice qualities reminiscent of ginger." Another taster found some "lead pencil notes, nice balance and it's very full and mouth-coating with glycerine giving it a sweet quality mid-palate. There's some currant notes and blackberry-like fruit here, too." 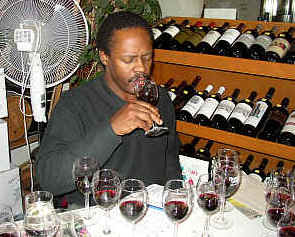 Gerald liked the high-toned red fruit fragrances and somewhat floral, Margaux-like nuances on the nose. It's perfumes are sweet. On the palate, there's a nice currant flavor along with some dark fruit notes and a bit of oak. Good wine! One-and-a-half stars." "Angular, bitter notes with some boysenberry fruit, chewy, chunky leathery notes and a dollop of balsamic elements...dill-tinged with a hint of toast." said the lead-off batter. A second person found this to be a "powerhouse, with dark fruit," while a third taster encountered a "glorious nose...lavish fruit and lavish oak...it's a bit sweet and low in acidity though I detect some tannin. It's a 'drink now' sort of Cabernet." One panel member found "ripe, herbaceous notes and a pruney quality, while being coarse and dull on the palate." Another taster found this to be "grossly extracted," while another critic said it's "sweet on the mid-palate." Gerald found "some herbal notes and mildly vanillin elements, with a creamy sort of fragrance. It veers off into being rather jammy and simple. It's soft and flat in terms of acidity and structure, though there are some tannins which make it coarse and mildly biting. It strikes me as out of balance and it has limited cellar potential." One taster characterized this as showing "Green beans!" Another found a "skunky, H2S nose with nice fruit, a somewhat sour finish with blueberries and blackberries...it's singular, soft and a touch sour." Echoing some of that was a third person who found this to be "too acidic and of medium fruit intensity." A fourth taster encountered some "green vegetal notes and, curiously, a note of sea salt and minerals...kind of Chablis-like, actually." Another person found "supple, harmonious notes with ripe anise, sage and clove spices. There's also toasty oak and earthy currants on the finish." Gerald liked the nose of this, finding "lovely sweet, ripe fruit and lots of cedary notes. There are some brown spice elements to the flavor, with a woodsy quality and some cloves and nutmeg. The tannins are such that a decade of cellaring might be warranted. One-and-a-half stars." "This displays intense espresso aromas with plum skins, loam and minerally fruit and it has an oaky, herbaceous finish." said one fellow. Another taster detected "sour grass, chocolate and espresso and lots of gritty tannins." Someone else felt this was a "bit rustic, reminding me of Cabernets from the early 1990s." Another panel member found "good structure and a rather complex wine." Another taster said it's "Unctuous and mouth-coating, with espresso, sweet tannins, currants and some blackberry fruit." Gerald interpreted the aromas as being a "bit stalky and stemmy, rather like celery or rhubarb. The same vegetal notes appear on the palate and so this wine lacks much in the way of excitement for me. If this is the wedding vineyard, I want a divorce." "Here's a concentrated, well-crafted wine with dusty plum fruit and cocoa powder along with pronounced oak notes." said one critic. Another person found "dusty red currant fruit and a tarry note. It's the best balanced wine with sweet plum fruit and black cherries. Nice balance." A third person found this to be "full of vanillin and oak notes with lots of wood." Another critic claimed it "has the best mouth-feel," while another said it's "the most tannic and firm wine of the tasting." "I agree!" shouted someone else. 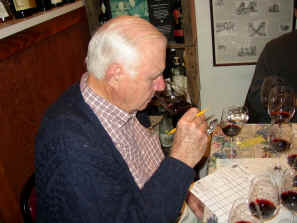 Gerald enjoyed the "mild pencil shaving fragrances in this mildly dustry Cabernet. The wine displays woodsy, dark currant fruit with some tannin. I find it nicely balanced, having enough fruit to outlast the astringency. Two stars+." Described by one taster as being "rich and showing chocolate notes along with some black cherry fruit, sweet vanilla and oak and a sage-like quality on the finish." Another person liked this because it's "powerful and has a great middle." Someone else found "cocoa and it's full, unctuous and has espresso notes on its rather long finish." A fourth panel member said "It opened nicely with time in the glass. It's a monster wine, silky, velvety and having a cranberry fruit note along with dark currants." Someone else found it "seductive, with candied apple notes and perfumes of the Orient. Very complex." Gerald notes "dark red fruits and some black cherries along with a hint of a floral quality. On the palate I found deep, rich, full-throttle Cabernet with a fair bit of tannin. It ought to be worthy of cellaring another 8-15 years. One-and-a-half stars."